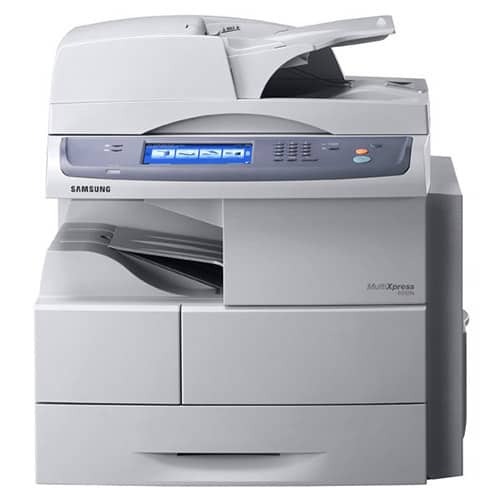 Samsung SCX-6555N Multifunction Laser Printer - Perfecta Business Services, Inc. The SAMSUNG SCX-6555N delivers high performance with a 250,000 pages-per month duty cycle, 3,240-sheet paper capacity, and an open architecture that enables advanced document workflow solutions. The SCX-6555N comes loaded with productivity enhancing features like an intuitive 7-inch touch-screen control panel, 80 GB hard drive, advanced scanning capabilities and more. With the SCX-6555N laser multifunction printer, it’s not hard to imagine. The SCX-6555N copies at a rate of 55 pages per minute. And when you add optional 500 sheet cassettes, you can increase paper capacity to 3,240 sheets. The 80GB hard drive allows advanced features like collate printing, proof printing, delayed printing, confidential printing and password protected printing. Samsung offers MPS, mobile, security and productivity solutions. These solutions allow you to create a more efficient and secure workgroup. The MultiXpress 6555N/6545N helps to distribute documents efficiently by scanning directly to email, FTP, SMB or client. Store scanned data into HDD and manage the stored data. Print and send your scanned data stored on the standard 80GB hard disk drive at any time.